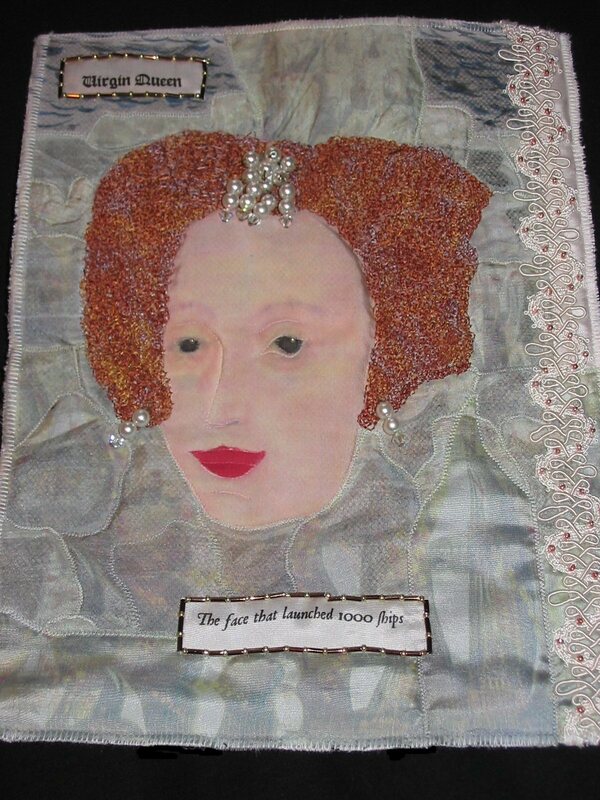 In 2004, I was part of a large textile art group making monthly quilt art pieces called Journal Quilts. They are sized 8 1/2 " x 11". That was the third year the project had been going. Many found it helped them develop their work in various ways. Below are the Journal Quilts I made. The exhibit, A Page from My Book: Journal Quilts 2004, consisted of five of the nine monthly Quilt Pages from each participating artist and was part of the Journal Quilt Exhibit at the 30th annual International Quilt Festival in Houston, Texas November, 2004. Later these quilts went on to be shown at the Spring Quilt Festival, Chicago, 2005. Mother – Photocopy transfer paste seems to give a ghostly image, so used it for Anne Bolyn. 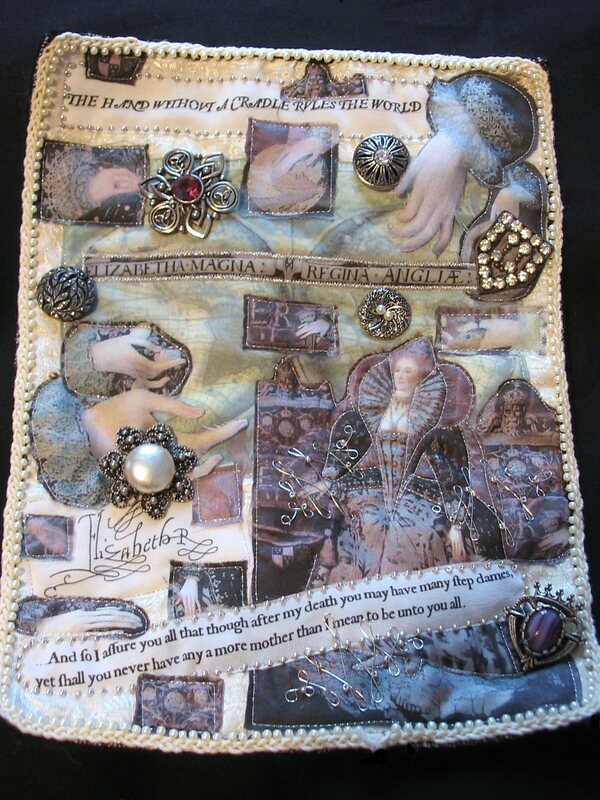 Page wanted hand embellishments; pearls, wirework, variegated rayon thread. Nearly ended up with RSI! I found JSL Font Converter by Jeffrey S. Lee to create Tudor look writing. I will use it throughout for the commentary. Virgin Queen – I tried to get transparent Armada ships by printing on Bondaweb and fuse it over QE’s face, but it went badly wrong. So, fussy cut ships printed onto silk and a new face, highlighted with silk paints…ironed onto the fusible… quite ruff like. FME hair made face pucker, so why not trapunto and an old earring? Now too small! Give up…Later, I extended one edge covering join with lace and beads; now I love it. 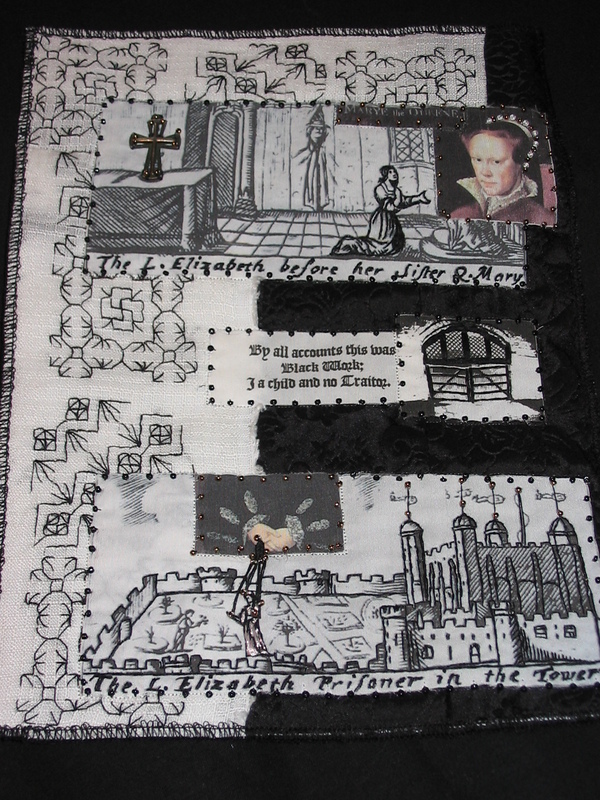 Mary I – Blackwork on linen, period woodcuts (of young QE before her sister Mary) & also Traitor Gate printed onto silk; embroidered and beaded. Cropped the scary Mary face, and used old cross from necklace. 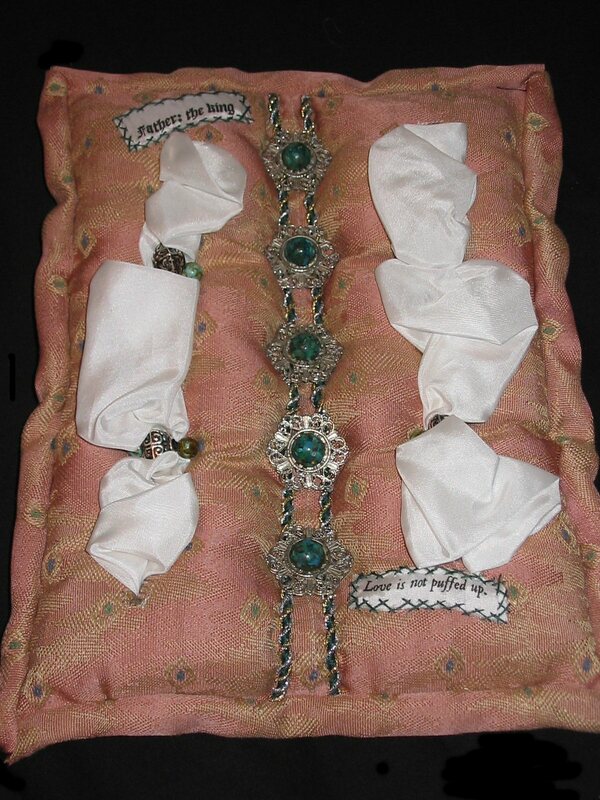 Mary often shown holding cord with book or medallion at end, so turned that into puppet strings for E in the Tower of London. In 2006, the organisers of the Journal Quilt Project decided to make a book about the process. Participants were invited to enter a certain number of pages they had shown according to the number of years they participated. 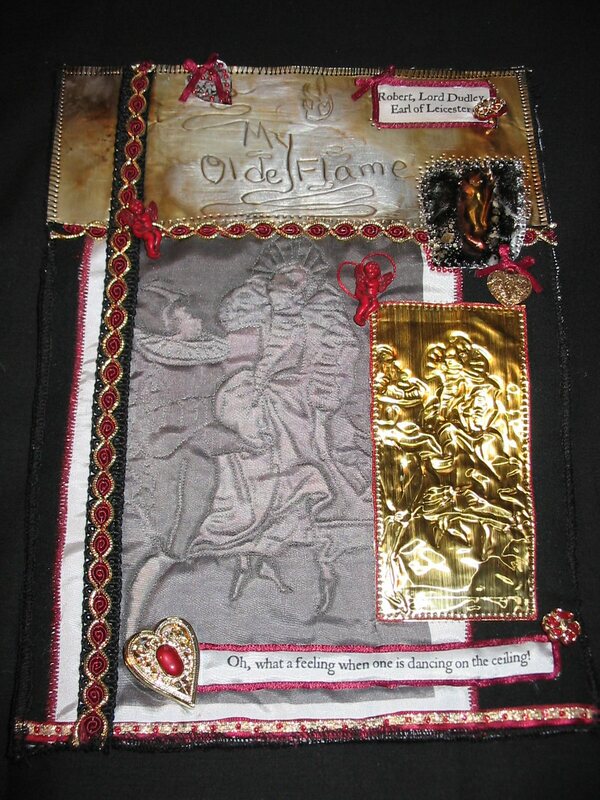 This page of my journal quilts was chosen to be included in the book called "Creative Quilting". Father the King - the picture in mind of Henry VIII as a child might remember ... the puffed up chest! upholstery fabric, slashed and stuffed, puffs of silk caught down with metal look beads. Centre front trim and pieces of vintage jewellery. It just had to say "Love is not puffed up." Robert, Lord Dudley – QE’s favourite courtier. I love the dancing portrait. I distorted it in Paintshop Pro using emboss/hotwax…That reminded me of shim work, so I played about with firing metal, embossing, etc. Fancy trim, beads and cheapy Victorian look buttons to embellish. Love the effect! 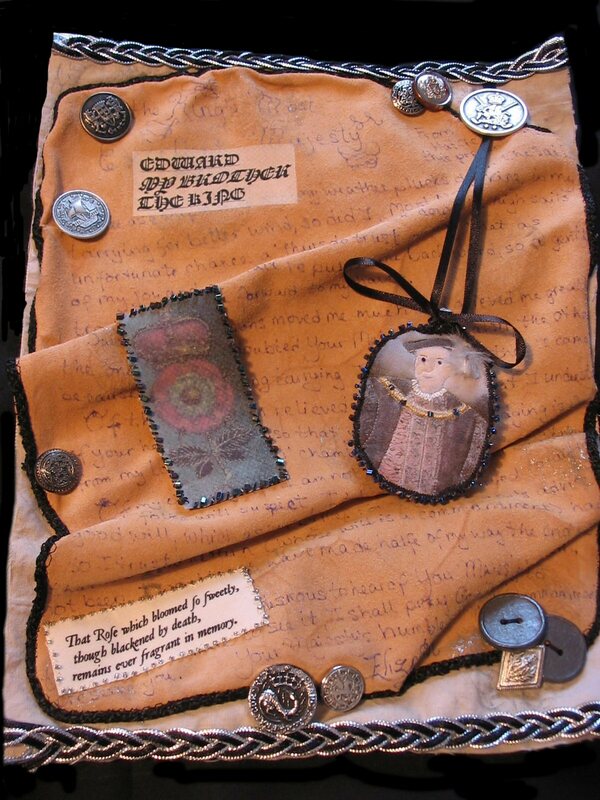 Edward VI - Elizabeth's letter to Edward when turned away from visiting when he was ill...written with ink onto leather. Vintage metal buttons. 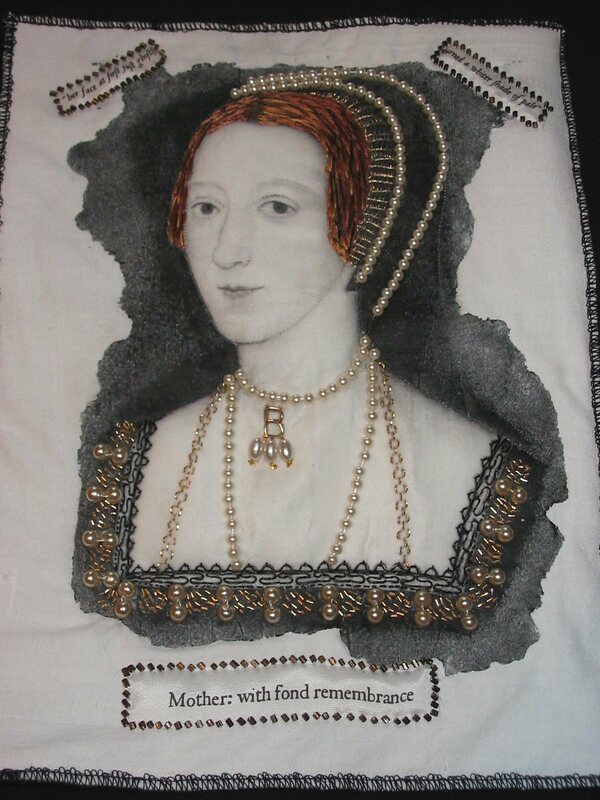 Tudor rose and Edward portrait printed on silk. Pendant made of bowl of silver-plated spoon. Edging ideas from Val Campbell-Harding. Leather is yet another hard thing to sew things onto by hand! 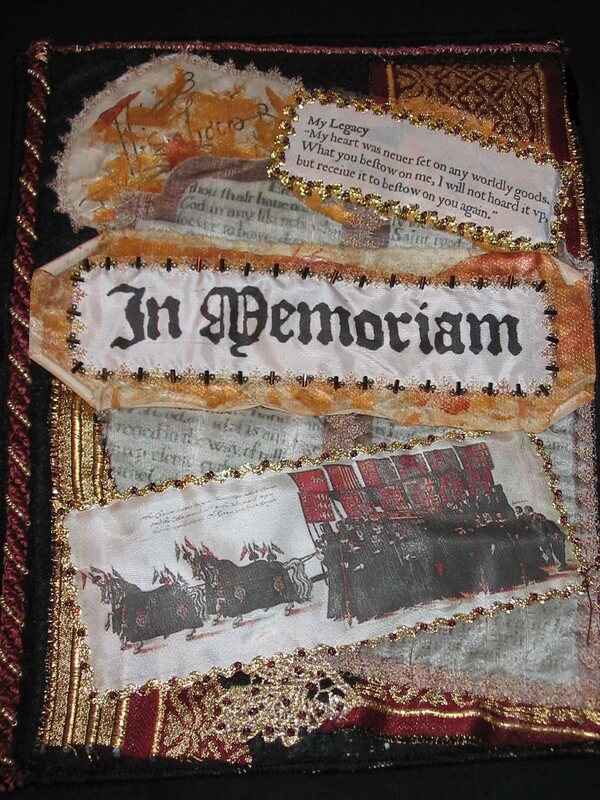 In Memoriam –Trying out things like acrylics on nappy liner, laser printing on silk, and whipped cord with beads. Had a tentative go with my new heat gun. Middle ground is Tudor church board with commandments. Period drawing of QE’s funeral. Advisors - from the Original Power Dressing Expert! 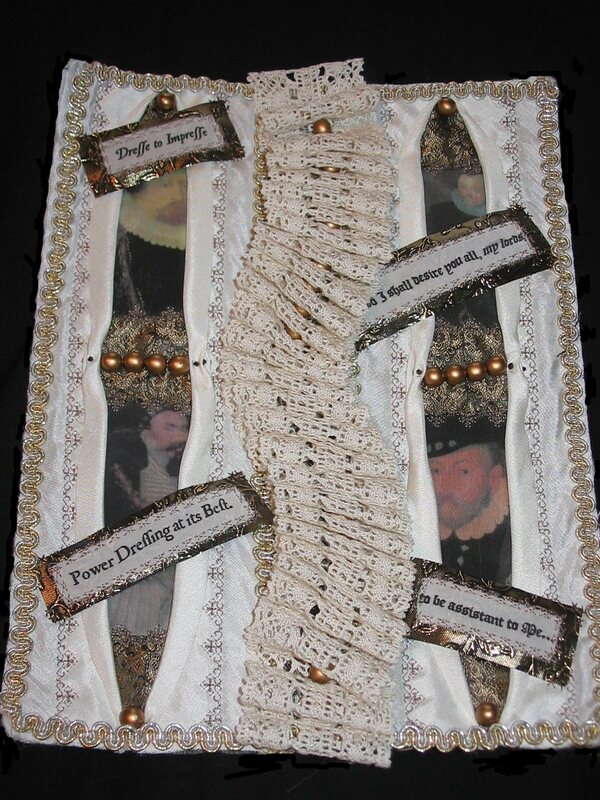 Four of the men who were Elizabeth's favourites, printed on silk and inside openings (a la Jennie Rayment). Cotton lace with gold-look beads reminiscent of the ruffs they wore. Quote from QE. Elizabeth Regina - Many of QE's portraits make a show of her elegant hands. So, I cropped them from the photos and included them all. Also exploring the flourishes QE decorated her signature with. portrait of QE with her "New World" gown merged with the portrait of her standing on a map of the world...also lion of England chair. So, "the hand without a cradle rules the world". Vintage buttons and brooches. In 2007, the Journal Quilt project will come to an end. Therefore, the quilts will be different from the other years. Instead of making multiple 8.5x11 Quilt Pages, in 2007 we will make ONE 17x22 piece. This piece incorporates at least three of the techniques found in the "Creative Quilting" book. Once again, photos of the quilts will not be shown until after the International Quilt Festival in Houston this Autumn.